5-Pack Free With Purchase Of Select 10-Packs! Buy select 10-Packs from H. Upmann Original, H. Upmann Vintage Cameroon, H. Upmann Vintage, Monte By Montecristo, Montecristo 2000, Montecristo Classic, Montecristo Original, Montecristo Platinum, Montecristo White, Primal, Romeo Reserva Real, Romeo Anejo By RYJ, Romeo Reserve, Romeo y Julieta 1875, Romeo y Julieta Crafted By AJ Fernandez, Romeo y Julieta Star Crossed, Romeo y Julieta Star Crossed Dark, and Trinidad Santiago cigars, get 5 cigars, valued at $21.30, absolutely FREE! You'll get 2 La Finca Ammo, 1 Thunderdome Gordo, 1 Black Abyss Connecticut Hydra, and 1 Boneshaker Maul. 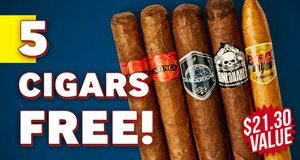 5 cigars free with purchase!